If you decide to sign up for a gym, how do you go about finding the one that suits you? Let’s look at an example. Germany’s largest chain of gyms goes by “McFit” and if the name for you conjures an association with a fast food restaurant, you got it exactly right. McFit prides itself with having one of the lowest monthly fees nationwide: €16.90 (about $21.50) per month, while they are open 24 h / 365 days a year. And in Germany you can normally expect to pay around €30 / month. I had a look at one of their places years ago, but what got McFit back to the forefront of my attention was when in the wake of the Love Parade catastrophe I read that Rainer Schaller, the festival’s organisator, is also the owner of McFit. On average, auditors at the multinational firm Deloitte found, there are only 10 trainers for every 7,000 customers at McFit gyms. 10 Trainers per 7,000 Customers? Let me repeat that: Around 10 trainers per 7,000 customers. How much coaching with how much quality and how much safety can we expect with that ratio? In a job offer for a fitness trainer I found on McFit’s website, the only fitness-related qualification being asked for is (my translation): “You have rudimentary knowledge in the area of fitness and can successfully apply it”. 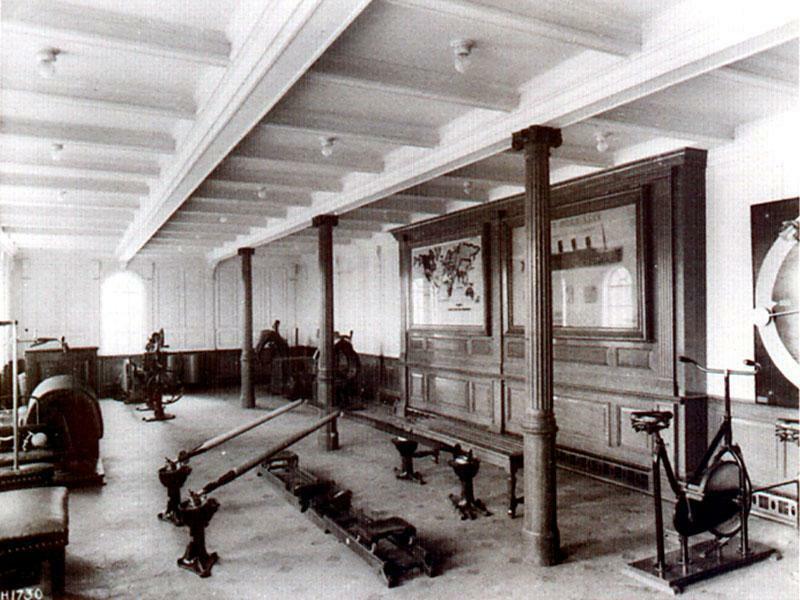 The Titanic’s gym – I’d rather have trained there. If you aren’t living in Germany, Austria or Spain, countries where McFit operates, you might wonder why all this should be of any concern to you. The answer is that McFit is a large operation, standing out for conducting business that way, but there are enough smaller fitness chains or single gyms operating very similarly. Is the staff qualified? Don’t be afraid to ask for their qualifications, after all you are paying for this, and when in doubt look up who issued the qualification. Anyone with a laser printer can give out certificates, so make sure they come from a respected organisation. Is enough staff around to assist you and are they friendly? The best trainers mean nothing, when they aren’t available or not willing to help you. Are the facility and the equipment clean and in good repair? You don’t want to run on a treadmill that decides to stop when you go at 30 mph, nor do you want to take home any little critters that might live on the handles. Does it have the equipment you need? When you are just starting out, you need a good selection of free weights, ranging from small to large. When you are advanced and want to train specific muscles in isolation, the machines for doing so need to be around. Do the opening hours fit in your schedule? For a good workout you need to be focused and shouldn’t have to squeeze it in, because “the gym will close in 30 minutes”. Only and only if you can put a checkmark next to all of the above, look at the price. If a gym fails on just one of these points, the lowest of prices will still be too much. I it is good if you already know what you are doing, problem is it’s only a small margin of people who know how to workout correctly. Yep, the qualifications don’t seem to indicate that they are looking for people with a lot of experience in the field. Personally I like the sound of Mcfit’s gyms. The gyms in my area are overpriced, and I do not use the saunas and whirlpools. And to work with a trainer you must hire them separately. I guess they would help you out if they saw you doing something dangerous, but I would like the access to the machines, without paying for all the fluff I won’t use. I simply cannot afford to join a gym with a monthly fee. Most machines are self-explanatory, and it seems to me we are better off with McFit than nothing. But what a sad and tragic story about the Love Parade. People just trying to have a fun time. My condolences to all the families. Yes, if you really know what you are doing, then one of those places might suit you. In the Love Parade disaster everyone is currently playing the blame game: The organizers, city council and police all put it on each other. But it won’t bring those (now) 21 dead people back. There are also at least 2 or 3 McFits in Vienna. I’ve heard of them and they seem to be just like any other gym around here except for the lower price. I didn’t know that they don’t have any sauna, etc. If I had to choose a gym then equipment, opening hours and location would probably be the most important factors which influence my decision.